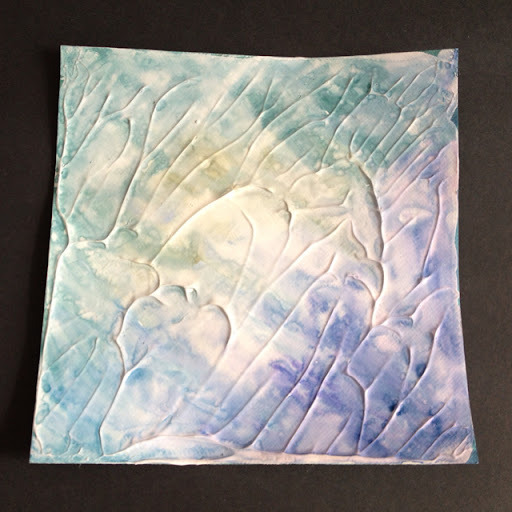 I bought a bunch of back-order issues of my favourite mag Craft Stamper, and in the November 2012 issue there was a tutorial about making cards with gesso bakgrunds. So first you start with 2 cardstock rectangles of the same size, and cover them both with a 1-2 mm thick layer of gesso. Then you put them together (gesso sides together) and press firmly. Gently and slowly pull them a part, leaving a nice pattern. Let dry overnight. After that you can either leave them white with silver paint on the raised details, or paint them with some kind of water colors. I used 5 different blue and green Distress Markers, scribbled with them (leaving much white), and painting over with a wet paintbrush. Finally I removed the excess water with a napkin. I decorated with a Tim Holtz stamp, using black StazOn to make it stick. 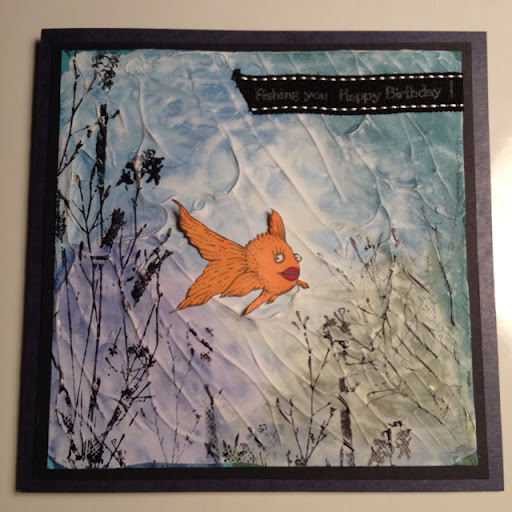 I also had a goldfish stamp that suited well. The greeting is from Skipping Stones design, and is stamped with Moonlight white Brilliance ink on a black ribbon. You can also decorate the border stampings with Stickles, but I skipped this step. I then mounted it on black paper, and put it on a card made from a midnight black/blue paper.